Who had so many holes being punched through their kokoro from this guy? I started these JUSTICE series from Akainu, However I think the universe hate him so much, that i lost my initial PSD files from BSOD during saving. So I lost the only file and almost gave up on this piece cus i dont have any backup. But i had like JPEG gile that i save to show my WIP, so i gathered back all my motivation to work on top of it. can i buy it somewhere that i can have it without watermark? Wow! Can you do Boa Hancock?! You're extremely talented! I can't wait to see your version of Hancock! I see, good idea. Plus it makes him look even more badass, like those scenes in the yakuza games. 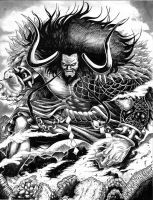 I'd love to have this + aokiji (+ maybe kizaru if that is a thing) as a printed version for my living room. That would be totally awesome! I literally just made an account here just to tell you, how awesome this is. Hey, that sounds awesome. Mind telling me where I can find this shop? Found the shop (if that is the active one) but couldn't find the trio there. ill link it to you later. yup that one is offline at the moment. What a powerful pose! It's awe-inspiring, my knees would be shaking if I was a pirate lol.